When was the last time you did something nice for your mother? If anyone is deserving of acts kindness, it is mothers. This wonderful list which is adapted from Sound Vision (where you can find the original article containing 10 ideas) should act as some inspiration. Don’t think Hawaii. Think of a day away from the kitchen. Or the home. Give her a vacation from the home where for her, most of the seemingly endless housework is done daily. Or, if she doesn’t want that, start doing your share around the house. Maybe you could start giving her one day of the week off, when she does no cooking or household chores. Remember, fathers and husbands work hard at the office, but they get a two-day weekend in most cases. Mothers usually don’t even get a full day off. And if they are also working outside, it’s like two full time jobs. While most mothers ask their children what they want to eat, turn the tables around and do the same for her. Is there special food your mother likes? Buy or prepare that food for her (if you are not the best of cooks, maybe it’s safer to just buy it). If so, buy a small cabinet and buy all of the books you can afford. Then take it to her home and set it up for her. If you can’t do that find her a book she would enjoy and surprise her. If your mother is in a nursing home, why not plan to bring her home for a weekend visit to stay with you. Even better, why not make this a weekly, or twice a month set up, so you can spend more time with her and she can be around those who really love her more often? Of course the ultimate gift will be if you can liberate her from that nursing home so she can stay in her room in your own home. If your mother is not alive, visit her relatives and friends and ask what you can do for them. This is a practical way to honour her memory. What other kind things do you do for your mother? Donate books for students, at home and away. 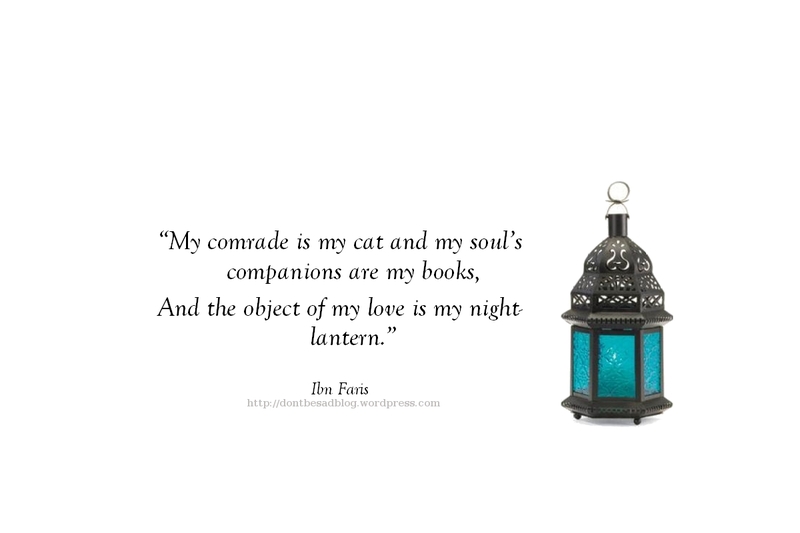 If you enjoyed this quote, then you can download a simple wallpaper for your desktop to remind you of it, complete with your own night-lantern, here. I’ve not always been an avid reader, although I have read since childhood. I’ve always wanted to read more, even now, when even apart from the reading for studies I read more than I have ever done. The following article at lifehack offers 14 ways to cultivate a lifetime reading habit. It’s very practical and worth reading for those wanting to read more, or even for new tips for those with an established reading habit. I especially liked the “Tech Trick” about creating an email account to store a list of books. I’m always loosing pieces of papers with book recommendations on them. I’m currently reaching the end of The Travels of Ibn Battutah and need to chose where to travel next…Perhaps Marco Polo’s writings might serve as worthwhile contrast?